Is everybody ready for some hurricane action? At our house, we’re pretty glad that we got that new roof. Beyond that, we haven’t done much in preparation for rain and wind. Cute W always keeps us fully stocked in the flashlight-battery department, because he’s Just. That. Handy. I filled our water pitcher and brought all of my houseplants back inside from their summer home in the screen porch. I must be getting old, because we’ve been through some natural disasters. Nothing that’s seriously threatened life and limb for us (knock on wood), but a couple were serious enough for a bit of adventure. Right after we got married, we were living in Des Moines, IA for the flood of ’93. My mother-in-law called us in the middle of the night to tell us that we should start filling up our bathtub and every pot that we had because the water treatment facility had been flooded and everyone’s water was getting shut off. We leaped into action and stored as much water as we could, then we sat down and realized that with the storm raging, sirens going off everywhere, and our adrenaline pumping, there was no way that we’d be sleeping that night. So we headed to the downtown library. We’d heard on the radio that they were requesting volunteers to help move books upstairs because they expected the lower level to flood. We joined a long chain of people passing books, and when all the books were passed, someone sent the whole crowd of us to sandbag. Phew! Sandbagging was sweaty, difficult, & discouraging work. I would love to say that we were so virtuous that we went hither, thither, and yon volunteering for the next several days, but actually, our sandbagging efforts slowed down considerably when we realized that we weren’t going to be able to take a shower anytime soon. We didn’t have any water for a week or ten days. We lived in an apartment building, and the tenants left their empty buckets and pitchers in the hallway. Whenever it rained, anyone who was home would run outside with everyone’s containers so that we’d have flushing and washing water. Another day I went out in our front yard in a bathing suit with soap and shampoo to shower in a hard rain. During this time of mostly-spongebaths, I was working as a temp. I remember one morning the agency called me to ask if I could be somewhere in an hour, and I sighed, thinking, if only I could take a shower. Good times! 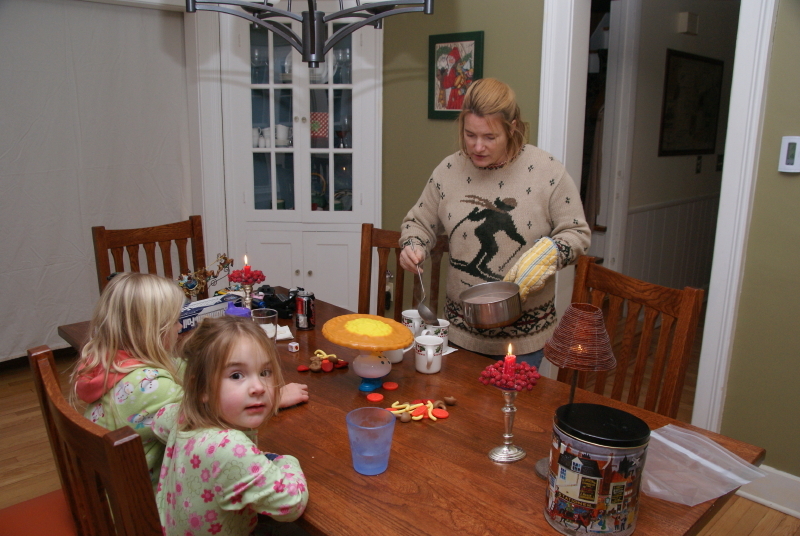 Speaking of good times, my daughters still have fond memories of the 2008 ice storm. We lost power overnight on Thursday-to-Friday, and power resumed on Sunday morning, and for the most part, the girls thought it was a fabulous adventure. We have a gas fireplace, so we stretched a sheet across the doorway out of our living room to conserve one heated space (you can see it in the picture below). I don’t remember what we did all day on Friday, but we made our own fun. Here’s a picture of us on Friday night. I’m serving cocoa that we’d cooked on our outdoor grill, and the girls and I are wearing about five layers of clothing. The flash makes it look like normal lighting, but we were actually playing Poppa’s Pizza Topple surrounded by candles. At night we all cuddled up in a group bed by the fire. They loved camping out in the living room, and since we’d already decorated (and baked) for Christmas, it was pretty festive. We spent part of Saturday at Cute W’s office, where we could enjoy heat, the internet, and television, and Saturday night was slightly less festive. Just as we were getting fed up with the situation on Sunday, the electricity came back. 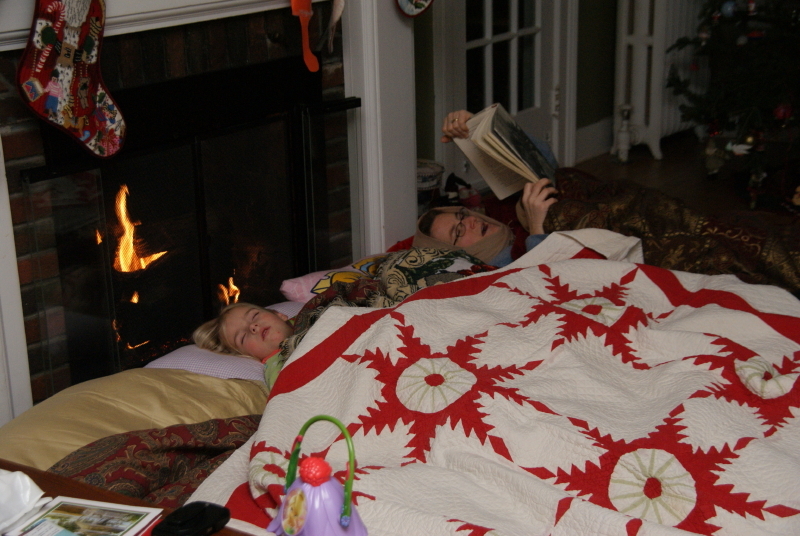 The next year, the girls asked if we could please do an ice storm camp-out again. How about you? Did other kids enjoy the ice storm as much as mine did? Hope that all of you & your families (and your basements!) stay safe and dry. I remember C B L and Z staying at my parents house for a few nights since they got lucky and NEVER lost power during that storm. I was in Albany at the time in a dorm and we lost it only for an hour or so. Yeah, and I remember being jealous that they had a free place to stay! I don’t think we lost power during the ice storm. We were prepared for losing power during this storm. My four year-old is disappointed that we didn’t lose power and he keeps turning off the lights. Yeah, our sump’s apparently too ginormous for that, but a generator’s in our not-too-distant future.